In 1972, seven years after the Watts riots in Los Angeles, Stax records from Memphis held a concert for the good folks in Watts to commemorate the anniversary of said event. Tickets cost $1 so as many people from the community could attend. Interestingly when Glastonbury had it’s first festival in 1970, tickets cost only £1. I love these kind of documentary films; Woodstock, Monterey Pop and Festival Express all cut from the same cloth and from the same time and not trying to form any kind of narrative, simply showing the concert interspersed with talking heads from the time. It washes over you and allows deeper access into the time and world in a way that conventional narratives don’t. You get to imbibe it with less guidance and that can e a good thing. Here, it is great. The film contains several sequences throughout the film with Richard Pryor, holding court and speaking on the black experience. Also throughout are scenes of African-American men and women speaking on this same subject. What it’s like to be black in America in 1972. These are very entertaining and contain an insight into the struggle, real people with real talk. They are the glue with which the film is joined together. And then there’s the music, some of the greatest musicians of the time on the Stax label come together for this unique concert. Talking of Coming Together, hearing Jesse Jackson’s stirring opening speech, I immediately recognized the sample that Primal Scream had used for their seminal single Come Together. From Kim Weston’s Star Spangled Banner through to the Bar-Kays, to the blues from Albert King and ending with the mighty Isaac Hayes, this is a film for music lovers everywhere. 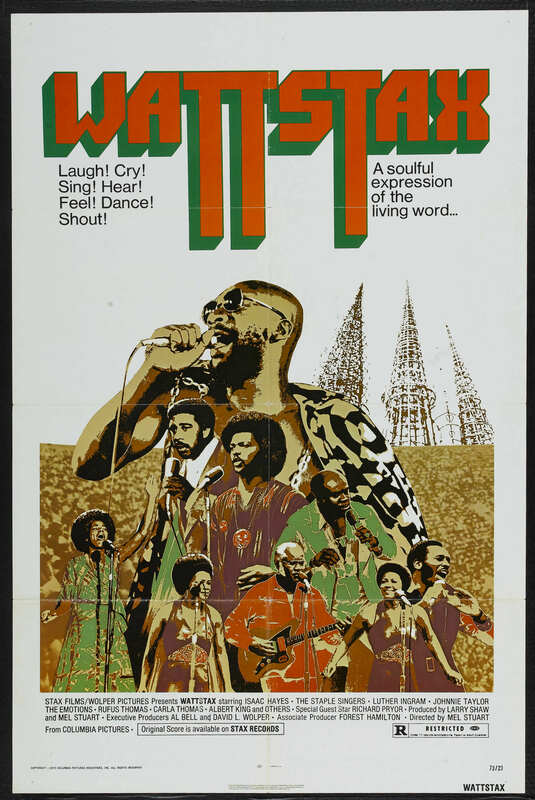 Like with the other musical docs I mentioned earlier, Wattstax gets to the core of the time, the concert, the people and the mood of the country. Directed by Mel Stuart, who also directed Willy Wonka and the Chocolate factory and was the first cousin of Marvel’s Stan Lee, here he does a tremendous job bringing all the elements together to create a feeling of what it must have been like to be there. One of the four cinematographers on the film was a certain Larry Clark, who went on to direct Kids. This is highly recommended to anyone who loves the music, the time, the history and the attitude.